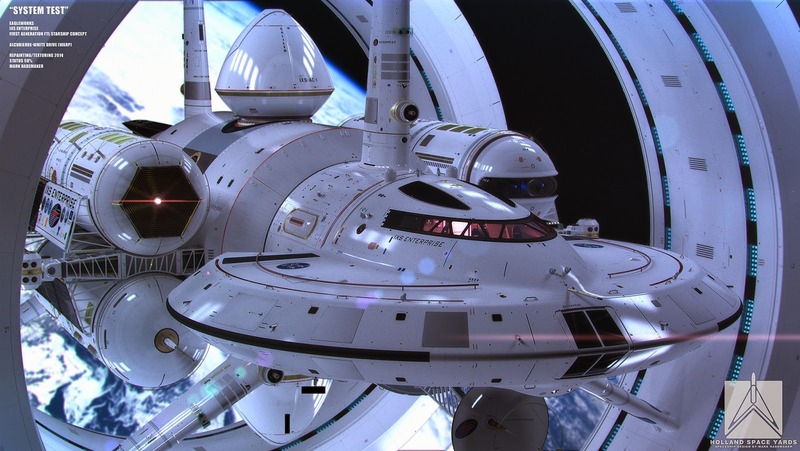 A warp drive may actually become a real thing. Permission to get a little excited. A couple of years ago, several stories hit the internet when physicist Harold White announced that his NASA team at the Johnson Space Center had begun work on the development of a warp drive. You can probably see how news of potential faster-than-light-speed travel might throw geeks into a Star Trek-fueled frenzy. White proposed a design that would solve the problems of the Alcubierre Drive concept. Most people have never even heard of this, much less know how to pronounce it. To really understand the basis of your excitement, you should probably understand this concept. Miguel Alcubierre is a Mexican born physicist that specializes in numerical relativity, using computers to formulate and solve Einsteinian field equations. In 1994, Alcubierre published a paper in Classical and Quantum Gravity titled "The Warp Drive: Hyper-fast travel within general relativity." In this paper he describes the Alcubierre Drive, a theoretical means of traveling within the framework of general relativity, and without the introduction of wormholes, that allows a spaceship to travel faster than the speed of light. This statement is a little weird considering the velocity of light speed limit as viewed by special relativity and general relativity. In the context of special relativity, the speed of light is the absolute fastest that anything with real mass can move (I'm not getting into tachyons right now) because relativistic mass increase limits massive objects to slower-than-light velocities. Put very simply, you gain mass the faster you go which then requires more energy to make you go faster. General relativity doesn't really forbid faster-than-light travel, but it does require the restrictions of special relativity locally to a region of space. Think: Speed limit on a specific section of highway. A way to get around this locality problem is the wormhole (Think: Shortcut) which, because it is providing a way to travel between two widely spaced locations in a shorter amount of time, results in an effective speed faster than that of light. Another way to beat the speed of light limitation is to use the expansion of the universe itself. And this is what Alcubierre proposes. As the universe expands, new space is being created between two objects. Obviously, the universe is really big (biggest understatement ever) and so when we talk about expansion we are talking huge scales. But Alcubierre's theory uses this concept on a more local scale. "The basic idea can be more easily understood if we think for a moment of the inflationary phase of the early Universe, and consider the relative speed of separation of two co-moving observers. It is easy to convince oneself that, if we define this relative speed as the rate of change of proper spatial distance over proper time, we will obtain a value that is much larger than the speed of light. This doesn't mean that our observers will be travelling faster than light: they always move inside their local light-cones. The enormous speed of separation comes from the expansion of spacetime itself." He introduces a "simple metric" that describes a flat region of space surrounded by a warp of curved space, a "hyper-relativistic local-dynamic space. Think: A bubble around your spaceship. This bubble is driven forward by the local expansion of the space-time behind it and the opposite contraction in front of it. Like riding the wave of space-time. However, there is one huge problem - energy. This type of travel is proposed to take massive amounts of energy. As in a "a ball of exotic matter the size of Jupiter" to power it. Clearly not the best way. Now back to Harold White and his team. Taking a closer look at the math, Whites's team discovered that the energy requirements might actually be much lower than previously thought. The answer is in the bubble itself. By making the bubble thicker and oscillating it, the amount of energy required goes from a Jupiter-sized ball to a 10 meter (32.8 feet) ball. Much much better. The team has since been using the White-Juday Warp Field Interferometer to experiment with tiny warp bubbles to find evidence for the theory. Lately - as in yesterday - White has released concept art created with 3D artist Mark Rademaker that shows a design for the type of ship that could utilize Whites refinement of the Alcubierre Drive. This concept art shows "a sleek ship nestled at the center of two enormous rings, which create the warp bubble," based on an idea by Matthew Jeffries (they guy behind the Star Trek look). If successful, a ship like this could travel to Alpha Centauri (4.3 light years away) in only two weeks! Okay, reality time. Should you be excited about this? Absolutely! But also keep in mind that seeing this technology for real is still a long way off. So be excited, but be realistically excited. Here's a good (but kinda long) lecture by White discussing the hard facts and some of the road-blocks behind this technology. Note: New design discussion starting at 41:51. "The Alcubierre Warp Drive" by John G. Cramer. A really really good explanation of the paper from the University of Washington's Center for Experimental Nuclear Physics and Astrophysics (CENPA). A source I used for a lot of the explanation above, including the reproduction of the figure from the original paper. iO9's story "How NASA might build its very first warp drive"
Gizmodo's "NASA Starts Work on Real Life Star Trek Warp Drive"
Science Alert's "NASA's design for a warp drive spaceship is AMAZING"
iO9's "Here's NASA's New Design for a Warp Drive Ship"
Sploid's "NASA's real life Enterprise may take us to other star systems one day"